neetswriter: A Lunch, a Launch and a New Venture! A Lunch, a Launch and a New Venture! It's been a busy but exciting week, sometimes everything happens at once! On Saturday, I went to the Romantic Novelists' Association's ("RNA") London Chapter lunch, on Tuesday I attended Pippa Croft's book launch for the Oxford Blue Series and on Wednesday I launched my new website, neetsmarketing. This is one of my favourite RNA events of the year, held in The Lamb, a Grade II listed Victorian pub in Bloomsbury, which still has the etched glass snob screens in place above the bar. The Lamb has that comforting aroma of beer and musty carpet which takes you back to the days when all pubs were like that. 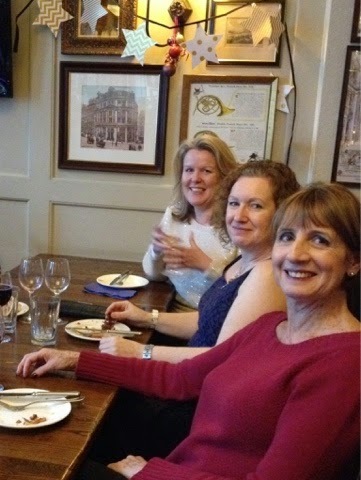 As is usual at RNA events, there was lots of meaty conversation and laughter, with wine thrown in. This year, the food was delicious with potato and beef croquettes, bubble and squeak cakes, mini sausages, and more…followed by macaroons and mini cheesecakes. The house white wine wasn’t bad either. An excuse to go into London in December is one to be cherished and I took a stroll along Piccadilly on the way back, taking in the atmosphere as I edged around clusters of Christmas shoppers. Then I dropped into my favourite Waterstones, where there are books you don’t see anywhere else. 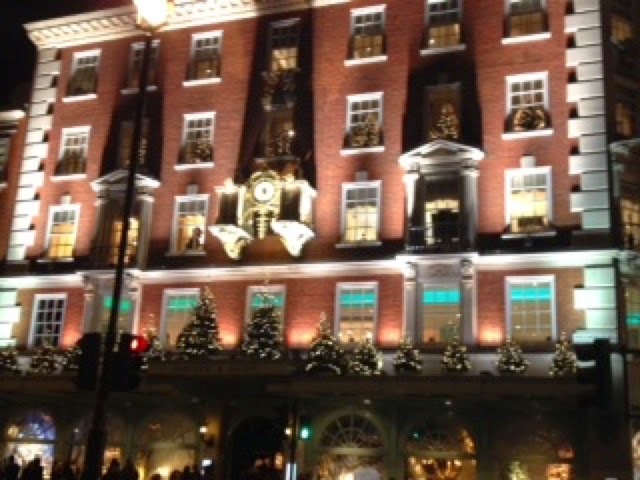 Fortnum and Mason looked particularly lovely dressed for Christmas. 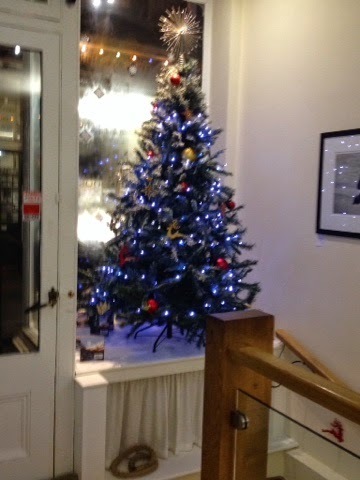 A few days later, I returned to London; this time to Goldsboro Books in Cecil Court, a specialist in signed first editions for Pippa Croft’s (also Phillipa Ashley) launch of the Oxford Blue Series. 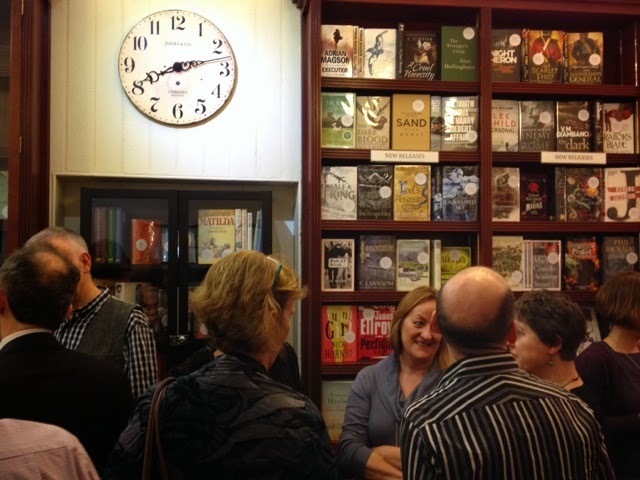 What a venue for a launch with shelves ceiling-high of signed first editions (including those by Agatha Christie and JK Rowling). It was lovely to be invited to celebrate Pippa’s success and a chance to catch up with old RNA friends, as well as to meet new ones. I’ve been on Twitter (@neetswriter) and Facebook since October 2011 when I started this blog. Since August this year, I’ve been Social Media Manager for the Historical Novel Society and more recently I’ve managed the social media for Corazon Books (3-12 December, to do more work in January). A few friends and acquaintances have asked if I could train them or do their social media temporarily, so I thought it might be worth setting up a website explaining the different packages I can offer. On Wednesday, I launched neetsmarketing. Thank you to all who have followed my new Twitter account @neetsmarketing and who have liked my new Facebook Page. I have some wonderful supporters out there, friends made online over the past few years, many of whom I've met 'in real life'. Ruth Brandt, winner of many short story competitions whose creative writing classes I’ve attended has posted the link on her Facebook group for creative writing students, a real honour. Thank you so much Ruth! A neetsmarketing blog on social media for writers will follow in 2015, with some special guests, who really know their stuff when it comes to social media. I wish you a Merry Christmas and a Happy New Year. Thank you for following my blog, for your support and comments on my posts, and see you in 2015! You're welcome Phillipa! Thanks for inviting me, it was a lovely evening. And thanks for the good luck wish. 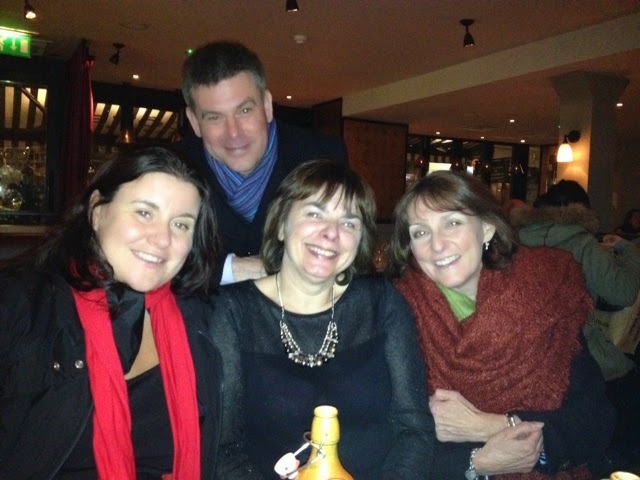 It was great seeing you at both the RNA London & SE Chapter party and at the Pippa Croft launch, Anita. Your new venture sounds really exciting. Good luck with it!! Thanks very much Liz! 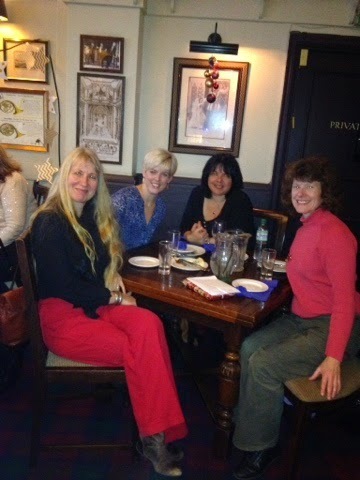 It was lovely to have a proper chat at the RNA London Chapter lunch, as usually we don't get chance when we meet. Lovely post, Anita - your socialising looks very enjoyable! And good for you tackling a new venture - all the very best with it. Look forward to hearing more about it in 2015. Thank you Rosemary! They were both lovely events. Hope you have a great Christmas and a Happy New Year. Thanks Vikki! They were both wonderful events and I'll be returning to Goldsboro books to browse those first editions, they'd make lovely presents. Hope you have a great Christmas and a Happy New Year. Just popped by to wish you a very happy and successful New Year, Anita. Thank you for popping over to view my blog. Lovely 'to meet' you and look forward to reading your future posts. All the best! Thanks very much for your lovely comment Nicola. Look forward to seeing more of your posts :-). Happy New Year!